December is truly a time for celebration, and for enjoying the traditions that come with it. One of those traditions is gift giving. Maybe you’re currently looking for gifts for a friend. Maybe it’s for a family member. Or maybe you received a gift card or cashed in some credit card points, and you’re ready to spend and splurge on yourself. 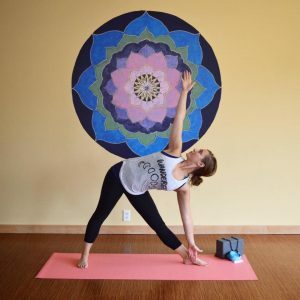 No matter who you’re shopping for, if they love yoga, there are lots of ways you can incorporate this love into your shopping list. 1) A new water bottle. Hydration is key in any form of exercise, including yoga. Granted, some yoga workshops will work up a bigger sweat than others by design. But no matter what, the work and deep breathing that goes into yoga can leave you tired and dehydrated if you’re not careful. So a new reusable water bottle might be just what your – or a friends’ – practice is missing. And these days water bottles even come in a foldable form, making them easier and more convenient to carry around than ever! Keeping It Green: At Green Yoga, we aim to offer a practice that is environmentally friendly and sustainable. That’s why we encourage members to use glass or metal bottles, and to avoid wasteful and even harmful plastic products altogether. Ditching the disposable plastic water bottles for an environmentally friendly choice is truly a win-win gift! 2) Yoga blocks. Yoga blocks are easily one of the most beneficial props available to yoga practitioners. They’re lightweight, inexpensive, and can be used in almost any posture that gives you trouble. Blocks can give you something to rest on if you can’t quite reach the floor. Blocks can also help you take pressure off of pain points if a certain pose puts you in a kneeling position. And using blocks to support any problem poses can help you, or a friend, or family member, benefit from those poses. Blocks ultimately make yoga more accessible and give us an opportunity to deepen our practice. Keeping It Green: As we mentioned, we aim to keep our practice, classes, and props as green as possible. Unfortunately, a number of yoga blocks available for purchase are anything but, as they are made from non-biodegradable materials. That’s why we recommend the Manduka cork block to yogis. This all natural piece of equipment is made from tree bark, but is still a reliable foundation for yoga practice! 3) Essential oils. Essential oils have gained popularity in recent years as a non-toxic aromatherapy option. Rubbing a dab or two of scented oil on your skin and breathing deeply can encourage calmness, helping us get into a happier headspace before we even begin a yoga session. That’s why purchasing a specific scent for you or a friend might be the perfect gift this season! Keeping It Green: Did you know many essential oils are not ethically sourced or from sustainable practices? Finding ethically made essential oils can unfortunately be challenging. That’s why we decided to make it easier for you. We carry doTERRA oils for the efficacy, purity and mindful harvesting yoga here in our own studio. We even have a calming Holiday Blend available now, should you decide to shop with us! 4) A yoga mat. This almost goes without saying, but a mat is essential to yoga practice. A good mat helps us keep our balance, while and old or slippery one is distracting and makes us work harder. Whether you’re shopping for yourself or for a friend, the holiday season could be the perfect time to replace an old mat or upgrade to a non-slip one. Granted, good yoga mats can be a bit of a splurge, but are worth it for frequent yogis. Yoga goers currently recommend a Lululemon mat – particularly for hot classes – or a Manduka PRO mat. Keeping It Green: Not all mats are created equally – and some are more healthy for use than others! Fortunately, there are resources out there that can walk you through the process of finding greener, healthier yoga mats for your friends – including this one. Our professional recommendations? Consider an all-cork mat from JURU Yoga – they create a wonderful all cork mat which is completely biodegradable and sustainably resourced. You can also purchase a biodegradable Manduka EcoMat in our own studio. As we look to 2018, the gift of yoga may be just what you, a friend, or a family member is looking for. We wish you all a very happy holiday, and can’t wait to see how your holiday purchases help you deepen your own yoga practice. Happy yoga shopping – and don’t forget to sign up for a class and to test your new purchases at Green Yoga soon!